Audrey Niffenegger and Eddie Campbell are immensely talented and acclaimed creators. Niffenegger is the author of the novels The Time Traveler’s Wife and Her Fearful Symmetry, and graphic novels like The Three Incestuous Sisters and The Night Bookmobile, among many other works. Campbell is the writer and artist of many comics. He drew From Hell and A Disease of Language, two collaborations with Alan Moore, in addition to writing and drawing Alec and Bacchus, all of which are among the best comics ever made. 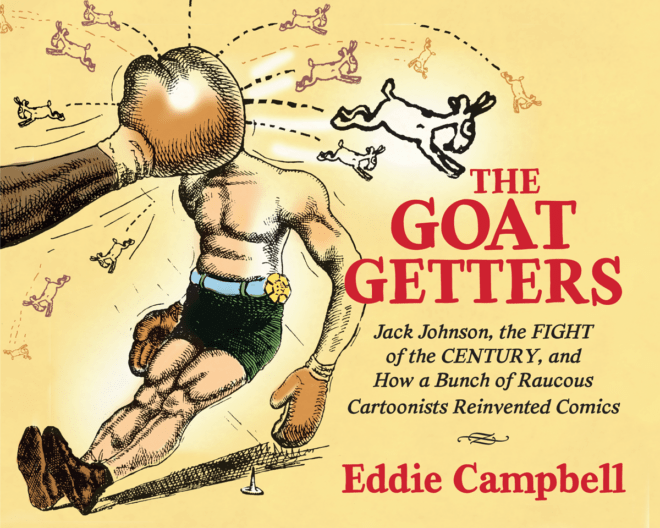 He has also written a new book about comics and comics history, The Goat Getters: Jack Johnson, The Fight of the Century, and How a Bunch of Raucous Cartoonists Reinvented Comics, which comes out this spring. The two are also married and have been collaborating on a number of short projects for the past few years. 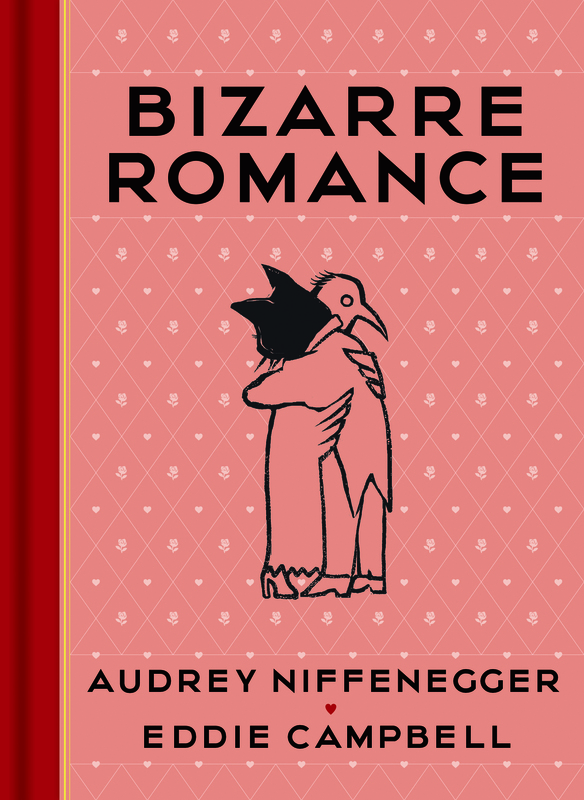 This week Abrams is publishing Bizarre Romance, a collection of short comics and illustrated stories that they made together. It should be no surprise to anyone who knows their work that it is a broad-ranging collection of styles and approaches. These stories are sweet and funny, touching and strange, inventive and a lot of fun. They were kind enough to talk about their working relationship and the book. Audrey, have you collaborated with people before like this? What was it like handing off the text and then seeing it come back? Audrey Niffenegger: I’ve done quite a few collaborations as an artist and each one has been different from the others. A few years ago I wrote and drew a story that became a ballet (Raven Girl, choreographed by Wayne McGregor for the Royal Opera House Ballet). Our book was interesting because Eddie and I began collaborating when we were still living on opposite sides of the world, in Chicago and Brisbane, and we were passing things back and forth by email and working stuff out over the phone. By the time Bizarre Romance was finished we were married and living together in Chicago. So Bizarre Romance is also our romance, in a funny way. It was interesting to see what Eddie made of each story. He had decided to try to give each one its own style. So I never knew what to expect, but I wasn’t worried. He didn’t approach anything the way I would have, but that produced something new and sent things rolling in interesting directions that neither of us would have taken on our own. Eddie, over the course of your career you’ve been the writer, the artist, done both tasks, what is it that you enjoy about collaboration? Eddie Campbell: Comics are a sociable medium, a great thing for two artistic people to get together on. Seeing another artist take your idea and run with it can be an exciting process, like acting in a play, taking on a different personality and seeing what happens. What if I were a completely different person from this chump Eddie Campbell, how might things work out? And it’s good to sometimes draw a story written by somebody else because it’s like jumping into the middle with all the logistical things already worked out and you just have to sit down and draw away. At what point did you two work on one story and at what point did it become, okay, let’s keep doing this? Let’s make a book. Let’s make five? 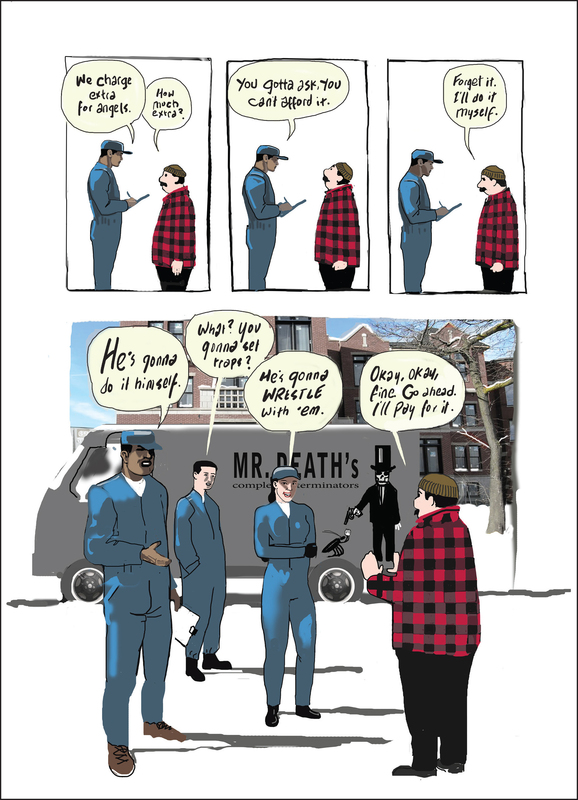 Eddie Campbell: As a paying job, a collaboration usually arrives by some third-party action, or at least that’s the way I’ve found it to occur. In this case our book started when The Guardian newspaper in London gave their Sunday color magazine over to matching novelists with comic book artists and Audrey and I were recommended for one of the handful of stories. 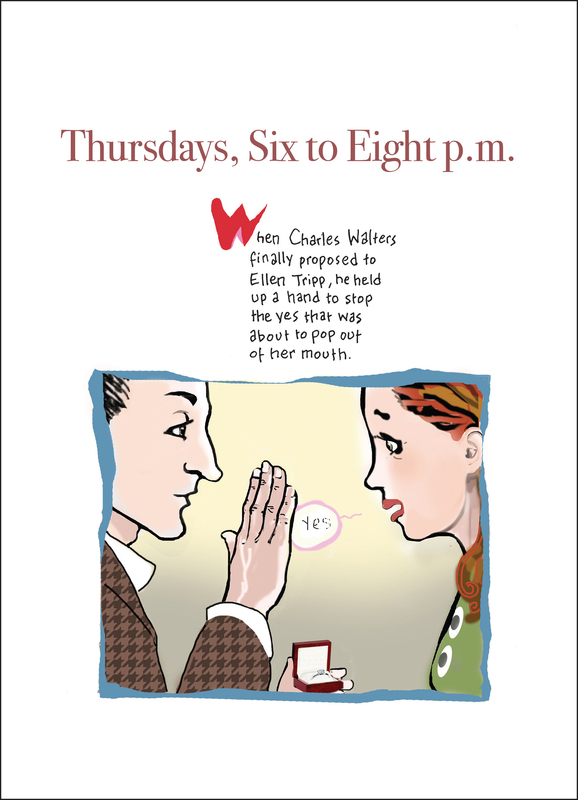 Audrey Niffenegger: When we were first dating I said, “Wouldn’t it be fun to make something together?” and Eddie said, “ah…not really, darling,” and I shelved the idea until The Guardian (actually it was Paul Gravett, whom Eddie calls the Man at the Crossroads) suggested we make a short comic together. Eddie Campbell: That’s the first one in the book, a modern day cockeyed romance that gives the project its title. 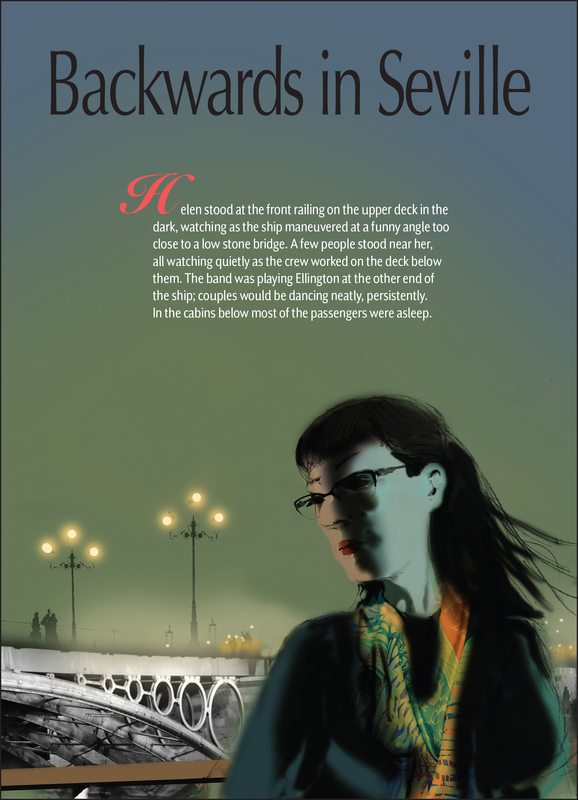 Audrey Niffenegger: And then we did another one for Shadow Show, an anthology of Ray Bradbury tributes (“Backwards in Seville”). Once we had managed to complete two stories without tears we got reckless and decided to make a book. 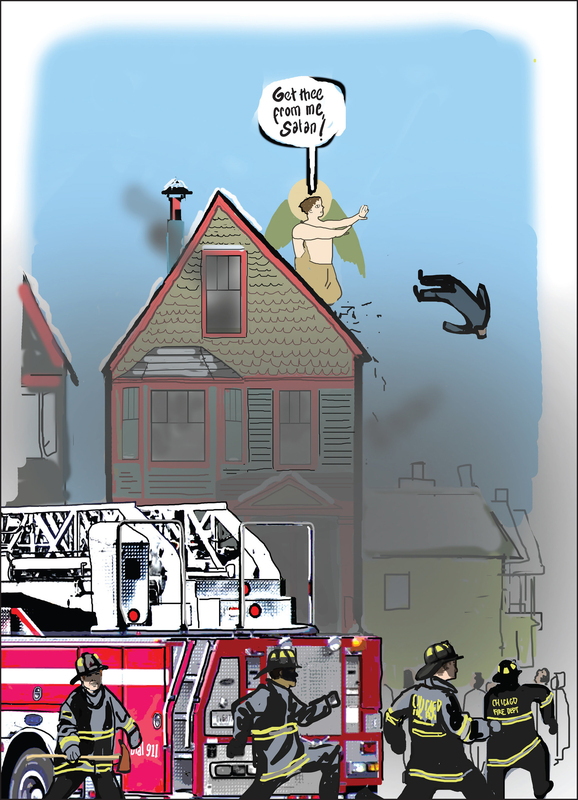 Some stories in the book are comics, some are illustrated stories, how did you decide what would be what? Eddie Campbell: “Secret Life, with Cats” is a story where I felt it would be clumsy to telegraph the ending before you arrive at it, which is an inherent problem with comics. It’s too easy to see a surprise long before you get to it. So, I handled that story with a number of spot illustrations and a big double page illustrated opener. The twist remains concealed until you arrive there. Unless you’re one of those goofs who reads the last page first just to make sure you’re going to get your money’s worth. In which case, there is no known cure for what you have. There are seven stories drawn in comics form interspersed with six illustrated prose pieces, but the reader who wants comics, and must have them, can be reassured that the greater number of pages in the book is made up of comics, and two of the comics stories go all the way up to eighteen and twenty pages. Among the other pieces there are some appealing novelties. 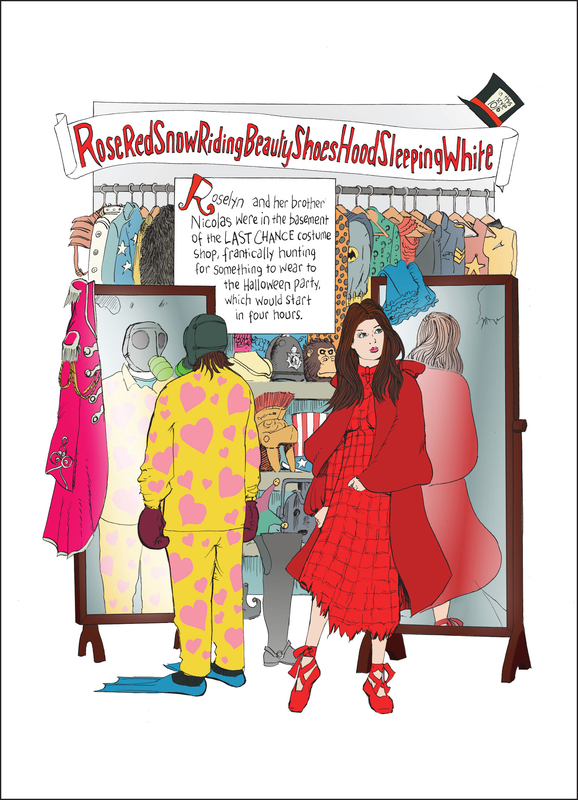 I chose to illustrate Audrey’s short prose work “The Composite Boyfriend” by making a paper doll guy, going across a spread, with all the tabs and choices of accessories. It’s a bit rude I should warn ya. For another short two-page prose piece, “At the Movies,” I paraphrased the whole narrative on a mock strip of film laid in pieces to make the opening two-page illustration. I had fun with it all, finding a different way to deal with each item. Audrey Niffenegger: It was difficult to explain the mix to our publishers, but once it was completed I think everyone liked the combination of comics and illustrated stories very much. I feel that each story was allowed to be itself, not wedged into an ill-fitting format. It’s more like a garden, not so much like a machine. I did want to ask about “Motion Studies: Getting Out of Bed,” which is one of my favorite pieces from the book, but it was a performance piece originally, do I have that right? How did you first work on it? And then how did you transform it into a comic? Audrey Niffenegger: “Motion Studies” was originally written to be performed with a group of interdisciplinary writers called T3 at the Museum of Contemporary Art in Chicago. It sounds more grand than it was, alas. I was inspired by Rebecca Solnit’s book, River of Shadows: Eadweard Muybridge and the Technological Wild West. I’ve been interested in Muybridge for many years but he is an enigmatic figure and I felt more confident imagining Blanche’s musings than I would have if I’d tried to make Muybridge the central character. The piece took me a few hours to write; Eddie spent many weeks making the drawings. Eddie Campbell: I’m so glad to hear you single that one out, Alex. It’s the story I devoted the most time to. I took Audrey’s comparatively short text and made it into an 18-pager, and for this one I painted the art in gray gouache. It’s a rumination by Muybridge’s favorite model, Blanche Epler, who was just one of a number of models he used in the ‘motion studies’ sessions. She’s in bed shivering in the cold and in ten minutes will have to get out and be photographed by three cameras from different angles, 12 times each, 36 frames in all. It’s about the things that might have gone through her mind in those ten minutes. Now, while there is a set of photos by Muybridge of a model getting out of bed, it wasn’t Blanche, so I had to create it anew. For me this artistic challenge resulted in the most satisfying spread in the book. Eddie, I know that you also have another very different book coming out soon. Or maybe not so different. Would you mind saying a little about The Goat Getters? Eddie Campbell: The Goat Getters is a project I have always wanted to see done but I was sure there must be somebody out there who would know more about it than I do. Alas, anybody who does know has lately died, so the task fell to me. This book is an account of the great goat-getting epidemic of 1907/08. Everybody’s goat was being gotten by a bunch of rascally cartoonists that included George Herriman, Tad Dorgan and Rube Goldberg. The fad required that when the cartoonist had cornered his prey he would have to show the victim’s metaphorical goat actually leaving his person, usually with a proprietary label attached to its tail. It was Tad who invented the expression, ‘got my goat,’ one of many expressions he claimed, or was said at the time, to have invented, such as ‘hot dog’ for the wiener in the bun. All of this was happening on the sports pages, which were the incubator for the daily comic strip. You see, on the West Coast, a cartoonist couldn’t get into the color pages because that stuff, Little Nemo and the rest, was all syndicated out of New York. So, the local guys made the sports pages their domain, and they did all kinds of loony stuff that wasn’t necessarily about sports. Krazy Kat, Silk Hat Harry’s Divorce Suit, Barney Google, Ripley’s Believe it or Not and the immortal Rube Goldberg’s Inventions were all a product of the sports pages. I ask the question: How did all this come about exactly? Nobody has ever tried to answer it before now. It turned out to be a very engaging story. It’s a full-bodied text of 90,000 words, with over 500 vintage illustrations, lovingly restored. Eddie, how have you been finding Chicago? Eddie Campbell: I have been a resident of the USA now for nearly two years, in case nobody has noticed. As an immigrant, I have been keeping my head down and not breathing too loudly. These are strange times in this loony land. But Chicago is one of the good places. Niffenegger and Campbell will be launching Bizarre Romance tonight at Women and Children First Bookstore in Chicago. More information about the event is available here.